On September 26, 1983, the Cold War between the Soviet Union and their allies versus the United States and their allies nearly erupted into full blown nuclear Armageddon when the early warning system employed by the Soviet military falsely reported the launch of United States Air Force Minuteman ICBM’s. 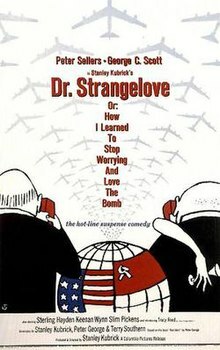 The only thing standing between mutual nuclear annihilation and continuing the strained peace was the critical thinking and decisions made by a single officer of the Soviet Air Defense Forces who correctly gambled the alarm was a false alarm and that initiating automatic massive nuclear counter-strikes was not warranted. The Cold War in 1983 was a tense time between the US and the USSR, with a bellicose President Reagan assuming a belligerent posture toward the communist bloc. The Soviets had invaded Afghanistan on December 25, 1979, angering the US, and the Soviets deployed a new regional nuclear missile in Europe called the SS-20/RSD-10. The US responded to the 14 new Soviet missiles by deploying 108 of their own similar Pershing nuclear missiles, further aggravating tensions. The 1981 deployment of American Ground Launched Cruise Missiles (GLCM) threatened Soviet territory, and American probing of Soviet radar defenses and mounting of psychological operations against Soviet defensive operators also raised the level of tension into 1983. Minuteman-III MIRV launch sequence: 1. The missile launches out of its silo by firing its 1st-stage boost motor (A). 2. About 60 seconds after launch, the 1st stage drops off and the 2nd-stage motor (B) ignites. The missile shroud (E) is ejected. 3. About 120 seconds after launch, the 3rd-stage motor (C) ignites and separates from the 2nd stage. 4. About 180 seconds after launch, 3rd-stage thrust terminates and the Post-Boost Vehicle (D) separates from the rocket. 5. The Post-Boost Vehicle maneuvers itself and prepares for re-entry vehicle (RV) deployment. 6. The RVs, as well as decoys and chaff, are deployed during backaway. 7. The RVs and chaff re-enter the atmosphere at high speeds and are armed in flight. 8. 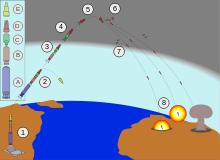 The nuclear warheads initiate, either as air bursts or ground bursts. The USSR responded to the threat of Pershing missiles that could quickly strike the Soviet homeland (while having no similar theater range missiles to strike the US) by going forward with Operation RYaN, their plan of using spies and electronic surveillance to quickly identify an American nuclear first strike (which they thought President Reagan may well have been planning) and either quickly mount their own preemptive nuclear attack or at the very least respond with a massive “mutually assured destruction” (MAD) attack of their own. The Soviet leader at the time was Yuri Andropov, former head of the KGB (Soviet intelligence and secret police agency rolled into one) who was a serious Cold Warrior himself. The Soviet downing of a Korean jetliner (KAL 007) on September 1, 1983 further increased international tension, especially since an American congressman had been aboard the plane. All 269 people aboard the jetliner were killed, among them many Americans. Thus, when Lieutenant Colonel Stanislav Yevgrafovich Petrov of the Soviet Air Defense Forces was on duty in a secure bunker outside of Moscow monitoring US nuclear weapon activity and the alert from a Soviet spy satellite came of a US launch of nuclear missiles, the danger of initiating a Soviet response was real, all too real. To the tremendous lucky advantage of Americans, Soviets and all creatures great and small on the Earth, an earlier warning had been initiated signaling a single US ICBM was incoming to Soviet territory. Petrov knew the US would never launch a single nuclear missile, as the retaliation by the Soviets would be massive. Only a mass surprise attack could reasonably be expected. Later during his same shift, another false alarm indicated the US had launched a mere 4 ICBM’s at the USSR, which again was deemed to be some sort of satellite or computer error, especially as some criticism of those systems had already been made, the idea of a nuclear attack with only 4 or 5 missiles being ridiculous. 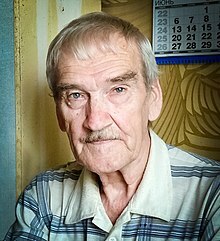 Petrov made the only intelligent decision that could be made under the circumstances, and did not strictly follow protocol and procedure, thus averting a nuclear disaster. Petrov was at first praised by a grateful chain of command that knew he had narrowly averted a global tragedy, but then when the higher ranking officers and scientists that had designed the warning system realized they themselves would be blamed for the near disaster, the promise of a reward for Petrov was revoked. The incident was not admitted to the world until after the dissolution of the Soviet Union. Questions for Students (or others): Were you previously aware of this incident? Do you think Ronald Reagan’s aggressive stance against the Soviets was a good thing or a dangerous thing? Ambinder, Marc. The Brink: President Reagan and the Nuclear War Scare of 1983. Simon & Schuster, 2018. Downing, Taylor. 1983: Reagan, Andropov, and a World on the Brink. Da Capo Press, 2018. The featured image in this article is a a diagram depicting the different stages of a Minuteman III missile path from launch to detonation, as well as the different basic stages of the missile themselves, from http://www.nukestrat.com/us/afn/Minuteman.pdf and completely re-drawn and re-worked from scratch by Fastfission in Inkscape. This work has been released into the public domain worldwide by its author, Fastfission. Fastfission grants anyone the right to use this work for any purpose and without any conditions.